Wow, yesterday's contest is almost a toss-up! The "air guitar" comment made us laugh out loud, but the t-shirt goes to Robin Rosen for her caption, "Always a bridesmaid and never a bride!" Urgh: How many times have I told you? Don't eat garlic before a performance. "You've got a little soup in your beard." And you expect me to kiss those lips after makin' out with that Erde tramp? Wait, hold still -- you've got something in your eye. It looks like ... a patch? 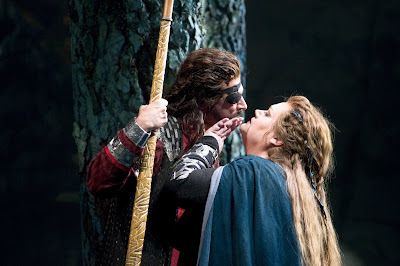 Really, Wotan, that beard has got to go! It's so scratchy when we kiss. Listen up brainchild -- if we are going to get away with just lip-synching, YOU HAVE TO MOVE YOUR LIPS! Forget the gold ring! You must wear silver with that outfit. Oops! I think I just got your beard caught in my braces! Darling, howzabout we add another notch to your spear? Like I said, "Talk to the hand." Not now, my neck just went out. Greer, I told you not now. Wait until we're back stage. Honestly, you're insatiable! Shhh, I have to tell you something. My back just locked up and you're going to have to carry me offstage... Well there's no need to look so frightened! Hush! Your threats terrify me: Surrender your spear and wield a torch? Wander Tacoma as a lowly glass blower? "Don't you have any kisses left for your own wife?" The Seattle Opera Ring It is The very best Ring in all the World. Realmente este es el meor Anillo de todos los que yo he visto, es sencillamente fantástico, increíble, ¡maravilloso! Espero volver el el 2013! !